Pineapple. First I add in fresh-chopped, bromelain-rich pineapple. Pineapple is the only known source of bromelain – you can get bromelain in both fresh or frozen pineapple. 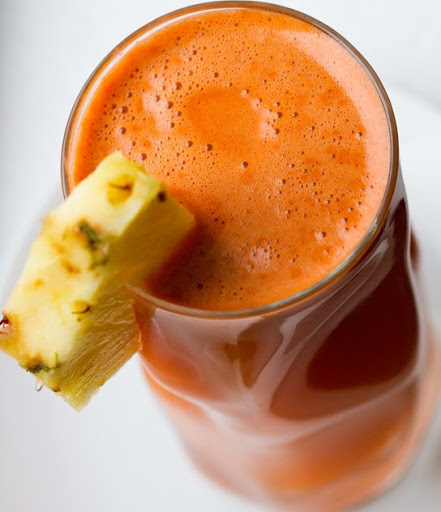 But for juicing sake – lets stick with fresh-cut pineapple. Pineapple is also an excellent source of vitamin C and Manganese. “Pineapple, whether fresh or frozen, is the only known source of bromelain – a protein-digesting enzyme that research shows to have anti-inflammatory properties that may alleviate symptoms of osteoarthritis, sinusitis and asthma; help heal injuries and inhibit the growth of malignant lung and breast-cancer cells.” -Dole Nutrition Handbook, pg 94. “Though raw carrots make a healthy and tasty snack, cooked carrots provide greater amounts of Vitamin A because the cooking process breaks down cell walls, enhancing nutrient ability.” -Dole Nutrition Handbook, pg 108. Celery! Then some crisp stalks of celery. Celery is not as nutrition-void as you may think!.. “Celery contains… [immunity-boosting] quercetin, apigenin and luteolin, as well as a healthy supply of Vitamin C, folate and potassium. Plus two stalks can fulfil 40% RDA of Vitamin K.” -Dole Nutrition Handbook, pg 81. Ginger! 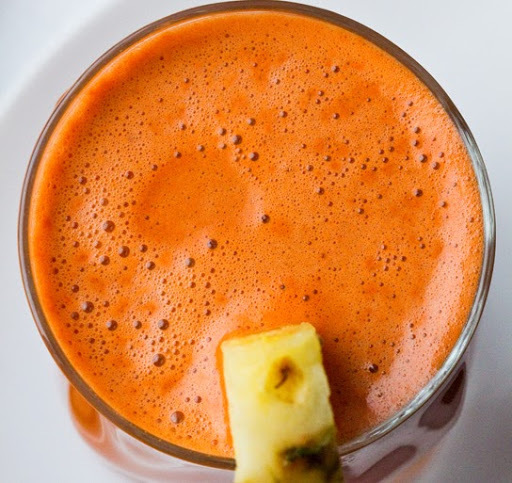 My fave juicing add-in: ginger. I added in stimulating, spicy ginger to make my health juice sing!